The Sun Blade Zone Manager must be enabled in Oracle ILOM prior to performing this procedure. For instructions, see Access and Enable Sun Blade Zone Manager . In the Sun Blade Zone Manager Settings page, click the Detailed Setup button. The Zoning Config dialog appears. Proceed to Step 3. The following message appears indicating no zoning assignments exist. Proceed to Step 2. If you want to manually create SAS zoning assignments using the Detailed Setup option, click Cancel and proceed to Step 4. 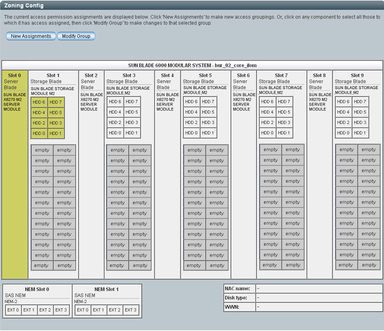 Clicking Cancel will open the Detailed Setup Zoning Config page. If you want to set up the initial zoning assignments using Sun Blade Zone Manager Quick Setup option, click OK and proceed to Allocating Storage to Entire Chassis: Quick Setup (Web). Click a blade server then click the storage resources (HDDs) that you want to assign to the selected blade server. Note - All HDD chassis slots that do not have an HDD storage device installed are labeled “empty.” Empty HDD chassis slots are not allocated to CPU blade servers. Caution - Alternatively, you can allocate storage resources to multiple blade servers; however, the servers must be enabled for multipathing. 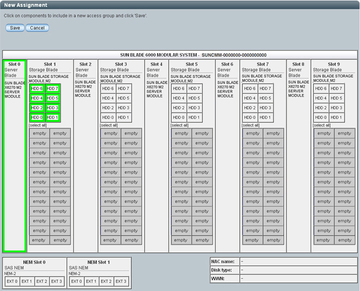 For further instructions, see Allocate Single Storage Resource to Multiple Blade Servers: Detailed Setup (Web). Although the Sun Blade Zone Manager displays them, NEM0 and NEM1 External SAS connections are not supported. To save the newly created blade storage group assignment, click Save. 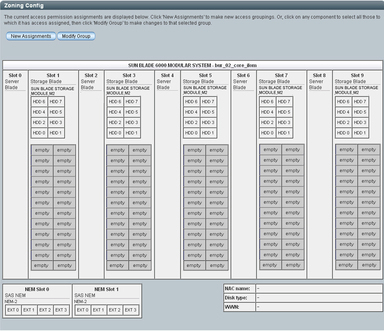 To back up the newly saved blade storage group allocations, see Backing Up and Recovering SAS-2 Zoning Assignments.